From what I understand the film is made for TV, it is the pilot for a series. I did however rent it, through an online company so it landed in my mailbox a while back, and a few days ago I got around to watch it. It is based on novels written by Alexander McCall Smith, a British author. The story takes place in Botswana. I have not read any of the books, but I have read a short story published in a weekly magazine. Which is where I came to know about The no. 1 ladies’ detective agency. 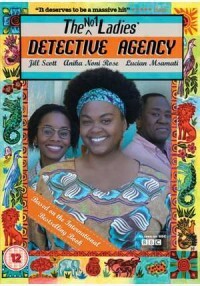 I found the story amusing and I really liked the character Mma Precious Ramotswe (here played by Jill Scott). I especially liked how she always said there was nothing that couldn’t be solved with a cup of rooibos tea. When I later noticed that the online movie rental had a couple films about it I immediately marked them for rental.